On any given day, the public plazas underneath the 46th street 7 train station is filled with people sitting, eating lunch or reading. The idea for these community-oriented public spaces, which became a reality in 2014, was masterminded by Rachel Thieme, the energetic and tireless executive director of the Sunnyside Shines Business Improvement District (BID). Since she took the position in 2012, Thieme has thrown free concerts, brought kid-friendly activities, and human-sized chess and other games to the plazas. Thieme comes from a background of serving local communities, starting on the West Coast. She supervised a meal program for homeless teenagers in her native Seattle, and later managed the expansion of the food pantry network with the San Francisco Food Bank. Thieme moved to New York and received a master’s degree with distinction in city and regional planning from Pratt Institute. She worked on technology projects for a public transit agency and later for economic development organizations in Brooklyn. 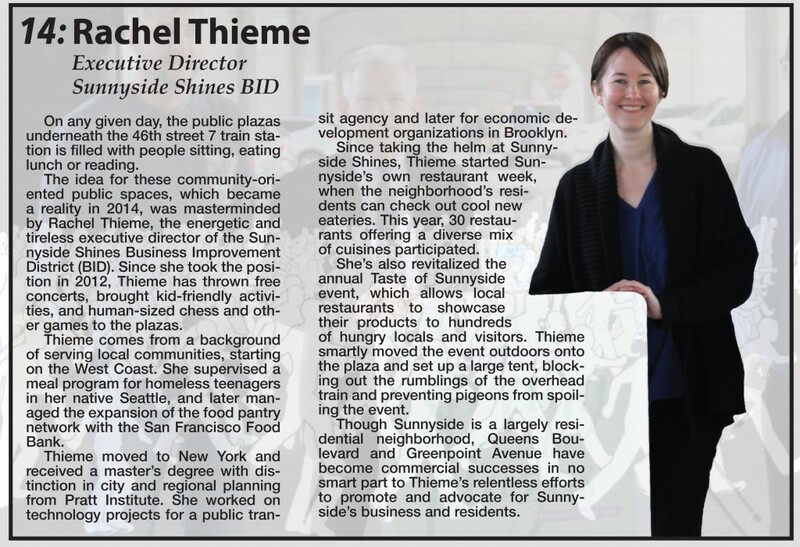 Since taking the helm at Sunnyside Shines, Thieme started Sunnyside’s own restaurant week, when the neighborhood’s residents can check out cool new eateries. This year, 30 restaurants offering a diverse mix of cuisines participated. She’s also revitalized the annual Taste of Sunnyside event, which allows local restaurants to showcase their products to hundreds of hungry locals and visitors. Thieme smartly moved the event outdoors onto the plaza and set up a large tent, blocking out the rumblings of the overhead train and preventing pigeons from spoiling the event. Though Sunnyside is a largely residential neighborhood, Queens Boulevard and Greenpoint Avenue have become commercial successes in no smart part to Thieme’s relentless efforts to promote and advocate for Sunnyside’s business and residents.